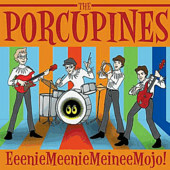 In Music We Trust - Porcupines, The: EeenieMeenieMeineeMojo! Ladies and Gentlemen? May I proudly present what may just be the greatest living-color collection of cartoon rockers since those fallen Archies --not to mention Nardwuar the Human Serviette's very own band of Evaporators. Yes indeed, Here They Come, strummin' down your street, The One, The Four only Porcupines! With their lyrical subject matters as fab-forever squeaky clean as their directly-plugged Rickenbackers, Dan, Chris, Jamie and Billy Porcupine pop and roll alongside all requisite masters past: for example, "Somebody Else's Thing" is most obviously the BYRDS' thing, "Students Of Chess" -- great title, btw! -- perfectly pits Searchers versus Beau Brummels, and "Yes I'll Cry" honestly is, no more and no less, the Great Lost Herman's Hermits hit (from the "Hold On!" score, I kid you not). Then, whilst showering us with expertly harmonied ooooh 'n' aahhhhh-drenched Meet the Beat-ballads, "I Am Told" quirks in and out of its tricky-Sixties B-sections as deftly as Sloan or even Barri ever did, while "Wilson Porter's Grown-Up Daughter" must honestly be the G-rated progeny of Stacy's (by way of each Fountain of Wayne's) Mom. Written and probably even recorded in the bedroom, but wholly worthy of the ROMPER room rather in its execution and sensibilities, this here's one near half-hour perfectly fit for your very own sonic small-screen come next Saturday morning. And then, Be Sure to stay well tuned for the Secret Hidden Happy Chrimble message as well, alright kids? Yes, in their very own parting words then, Watch Out for The Porcupines!